Compared to the traditional choke collar that is aggressive and uses uncontrolled force to correct negative behaviors. Wellbro martingale-style collar tightens enough under tension to provide a subtle controlled training cue to your dog. The purpose of this is not to choke a dog, but to prevent a dog from escape the collar because it offers limited closure. Endorsed by thousands of trainers, our humane dog training collars are much safer and more effective. 1.More Control: Martingale collar provides more control when used on dogs that are prone to pulling and helps the dog learn some basic commands. The limited cinch collar is designed to provides limited correction with an audible cue. 3.Durable: Solid stainless steel and is heavy duty and rust-proof and nylon woven webbing is strong with good color fastness. 4.No Choke: This martingale collar has a limited closure design and the convenience of adjustable sizing, which ensures that it won't fully close or choke a dog as a choke collar does, it only contracts so it stays snugly on the dog. MARTINGALE DOG COLLAR: This excellent dog training collar not only can provide more control and prevent the chance of escape, but also functions in a gentle and humane way of correction than a choke collar to prevent from choking and make dog training safer and more effective. ADJUSTABLE CLIP AND BUCKLE: The square webbing clip allows you to make size adjustment for comfortable fit to your dog neck before put on your dog and the quick-release buckle makes it quite easy to wear and detach. REFLECTIVE LINE AND AUDIBLE HALF CHAIN: The nylon collar has 5 reflective lines which increase its visibility to ensure enough safety at night walking time. The design of limited chain closure won't close or hurt dogs while create an audible sound that further reinforces the safety. TOP MATERIAL QUALITY: Made of premium and soft nylon webbing and solid stainless steel chain with a D-ring attachment which won't get rusted after long-term use. This nylon snap chain is an ultimate balance between durability, functionality, and aesthetic appeal. SIZE/COLOR DETAILS: Size "S": length adjustable between 11.5"-14" and width of 0.8". 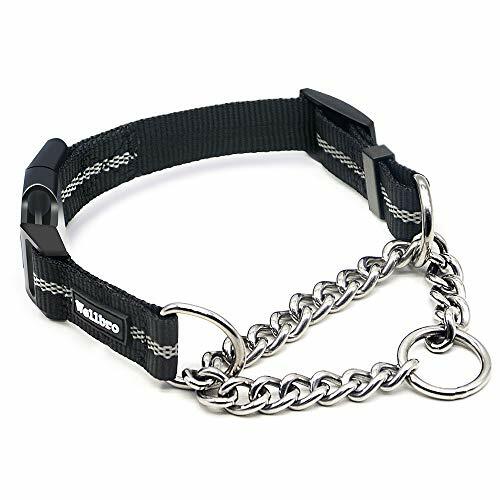 This nylon dog collar is available in two colors of black and gray. View More In Slip & Martingale Collars. If you have any questions about this product by Wellbro, contact us by completing and submitting the form below. If you are looking for a specif part number, please include it with your message. DYBEN Pet Training Snake P Chain dog Choke Collar,Sliver,26"